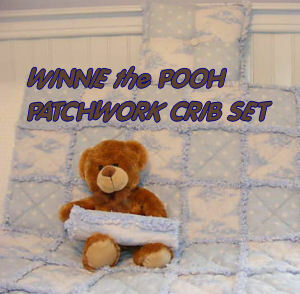 Why stop with one cozy quilt in classic Pooh when a Winnie the Pooh patchwork crib set will get the job done quickly? Your crib will be decorated in accessories that are perfectly color coordinated and matched according to style and design right from the start with very little effort on your part. This may not sound like a big time saver to some mothers, but those of you who have spent hours if not days mixing and matching yards of quilt fabrics know this to be a fact. There are several collections of classic Pooh crib bedding in patchwork styles offered at very inexpensive prices in the online baby boutiques. If you can find one in a color scheme that pleases you at a cheap price, by all means go for it. There is nothing wrong with decorating your baby’s nursery with a store bought Winnie the Pooh patchwork crib set rather than homemade bedding. Of course, you can always change up a commercial set with the addition of a cute, rag quilt or homemade patchwork crib quilt in addition to the comforter that comes with the crib set to give it a personal touch and give it a unique look. If you are an accomplished quilter, this is one method that offers a virtual guarantee that the colors and prints are perfect; buy Winnie the Pooh quilt fabric and make your own crib quilt and accessories. If you have never made a baby quilt, you might want to start with a winnie the Pooh quilt kit that comes with everything you need. 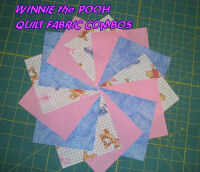 Another option would be to buy some Pooh Bear quilt panels and alternate the squares with fabric in coordinating colors. If you select a plain rather than a pre-quilted Pooh fabric panel, you can stitch outlines around the storybook characters to add interest to the piece and give your Winnie the Pooh patchwork crib set texture. You may ask where can a mom who doesn’t know a quilt pattern from a petunia get a Winnie the Pooh patchwork crib set when the stores don’t have what she wants. Do some checking to see if there are some local quilting circles that take orders. If you can locate one of these groups through your local homemaker’s guild or 4H club, these ladies turn out beautiful work for very affordable prices. Another option is to check online auction sites for sellers who specialize in needle crafts and are paid by the job. Once you find your seamstress, all that you need to do is pick a yard or two of whatever color and style fabric that you need and send it to be sewn according your specifications. You may want to contract your crafter to make your curtains as well as crib accessories so be sure that buy the right number of yards to successfully complete the job. Return to find more examples of Baby Nursery Ideas and Themes where nothing but patchwork crib sets will do!